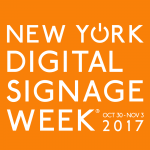 Next week, we’ll be kicking off the biggest New York Digital Signage Week ever – last year saw an amazing 25 events, this year, we have 32 throughout the whole week (and yes, that includes plenty of things to do on the Friday as well). The centre pages of our printed newspaper has the list of events that were announced when we went to print (a useful handy guide, and if you look on the following pages of the newspaper, we have the FULL agenda of all four conferences taking place that week as well – most useful) but the very latest list of events can be found online on the OFFICIAL web site here. 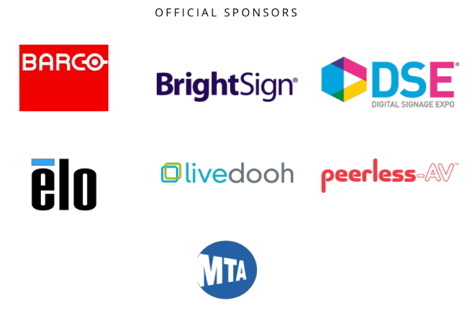 The DailyDOOH Investor Conference is looking like it’s going to be one of our biggest as well, with registrations already surpassing last year. We also hear that the super-exclusive Peter J Solomon Cocktails on the Monday evening for senior industry execs is likely to attract a whopping 200+ folks. Oh, and of course it’s still supposed to be secret (like one of those raves you receive directions for in the middle of night from complete strangers) but we also hear that the venue for Scala’s 30th Anniversary party was also announced late Friday night. This entry was posted on Tuesday, October 24th, 2017 at 00:01 @042 and is filed under DailyDOOH Update. You can follow any responses to this entry through the RSS 2.0 feed. You can leave a response, or trackback from your own site.